What is clinical hypnosis (hypnotherapy)? When talking about clinical hypnosis some people use the term 'hypnotherapy'. 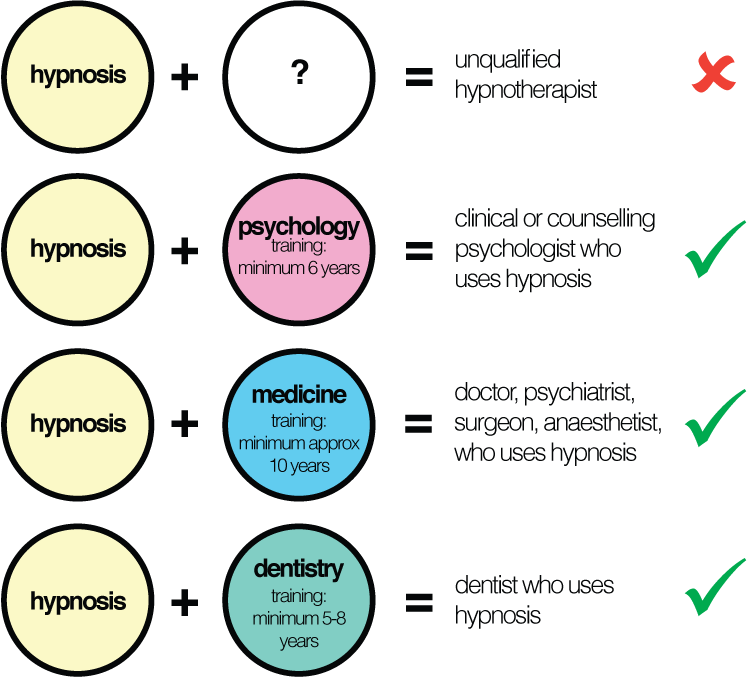 The name 'hypnotherapy' is misleading though - hypnosis is not really a therapy in its own right. Hypnosis is better thought of as a 'tool' - it is a way of using hypnosis to achieve certain goals. In the same way that a mechanic will have an understanding of engineering, good hypnotherapists will have had training in models of human emotion and behaviour. If you want to have therapy involving hypnosis you should make sure that your therapist has had training in at least one model of therapy (such as CBT, or psychodynamic psychotherapy) before they completed additional training in hypnotherapy. There are many different models and types of therapy. It is helpful to ask what model(s) your therapist has training in. In some cases a therapist might give a direct suggestion (e.g. "as you focus on being in that pleasant place you can allow the intensity of that [sensation/pain/nausea] to reduce"). Alternatively the therapist might help the client revisit memories from the past. If the therapist believes that particular memories of an event are causing difficulties, these might be identified, watched, and 'resolved' or 'processed' in different ways. For example, the therapist might invite the client to 'watch' a traumatic memory on a tv screen. Hypnotic techniques can be used to explore the origins of a problem. According to some psychological models a cause of current distress can be unresolved emotion related to past events - but to which the client may have forgotten. One common way of uncovering the original event this is to use an 'affect bridge' technique. In this technique the client identifies a time in the present when they felt a certain emotion (e.g. shame) and might be invited to "allow your mind to find another significant event from your past when you felt the same way". Will I remember what happens in a hypnotherapy session?